How to occupy a child on a long journey: teach it to do something a little bit naughty. It will be completely captivated for however long it takes. Example #1: blowing bubbles with bubble gum. Laura often surprises me with a new ambition, and the latest is to learn to blow bubbles with bubble gum. I suspect it is inspired by watching Sky television: in her favourite show, iCarly, resident bad girl Sam is an expert gum blower. For most of Laura’s friends, bubble gum is a banned sweet and she’s never tried it before. But she has good strong teeth and I decide it won’t harm her to fulfil her goal at least once in her childhood. I therefore invest two euros in a hypermarket grab bag of bubble gum and cunningly produce it just when we’re getting to the “Are we nearly there yet?” stage of a three hour drive during our French summer holiday. Laura is enchanted. For the next half hour, I sit alongside her on the sofa of our camper van, training her in this not so gentle art. It must be at least 30 years since I last blew a bubble gum bubble. But sinking my teeth into the solid pink rectangle, I realise that it’s like riding a bike: once learned, it’s a skill you never forget. I demonstrate how to soften it up, stretch it with your tongue and catch it with your top and bottom teeth before slowly, gently blowing into the middle. The resulting pink globe emerges to a look of disbelieving rapture on my daughter’s face. Can this really be Mummy doing this? It’s a special mother and daughter bonding moment. I’m about to screw up the wrapper and put it in the bin when I discover a hidden bonus: inside each paper is a temporary stick-on tattoo. I demonstrate this on my arm (precipitating odd looks in the patisserie later). 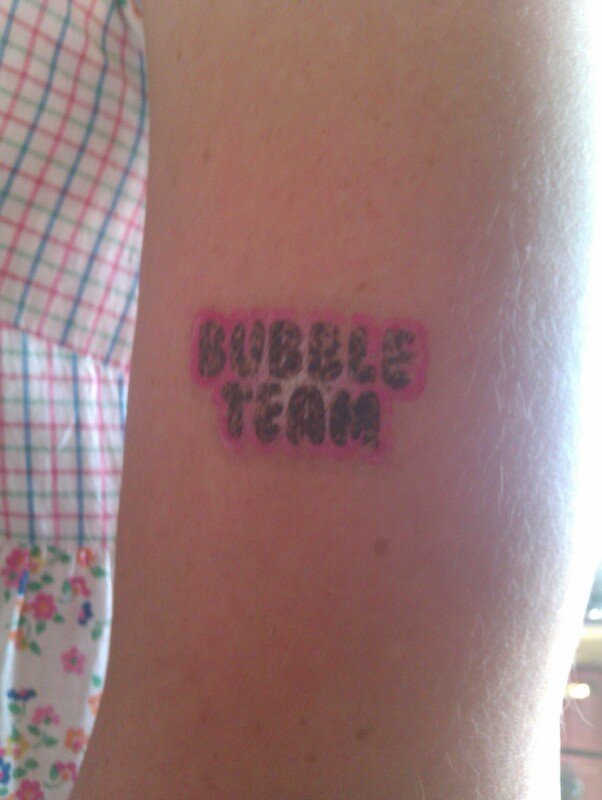 Appropriately my tattoo spells out the legend “Bubble Team”. We investigate other wrappers, branding Laura with French slogans such as “completement mabulle” and “ce dechire“. With the help of a pocket dictionary, we translate these tattoos loosely as “completely bonkers” and “it’s ripping”. If this doesn’t gain me Cool Mummy points, I don’t know what will. Still chewing, I return to my seat at the front of the van, leaving Laura to refine her bubble blowing technique unobserved. By chance, my husband has put an Eagles album on to play. It’s a Proustian moment: the heady cocktail of gum and Hotel California transports me back to my teenage years at an international school, where many of my friends were American. For the next few kilometres, I’m gazing out of the window idly blowing bubbles. It’s not the Loire Valley that I’m seeing, but the smiling faces of those fine gum-blowing gals. I think about the parties, the dances, the in-jokes we shared; the teachers, the lessons, our pride on graduation day. And then I remember another small detail about the art of gum-blowing: never blow a bubble into an oncoming wind. Sticky-faced, I furtively close my window, hoping that Laura wasn’t watching.